The first thing that came to my mind when I saw this photo was what makes a house a mansion? Wikipedia provides the following definition: "A mansion is a large dwelling house. The word itself derives through Old French from the Latin word mansio "dwelling", an abstract noun derived from the verb manere "to dwell". The English word manse originally defined a property large enough for the parish priest to maintain himself, but a mansion is no longer self-sustaining in this way (compare a Roman or medieval villa)". What can you tell us about this particular mansion? Well, the NIAH seems to think this house is a myth, anyway. [https://www.flickr.com/photos/[email protected]] We like myths! It appears to be facing west, which is unusual. 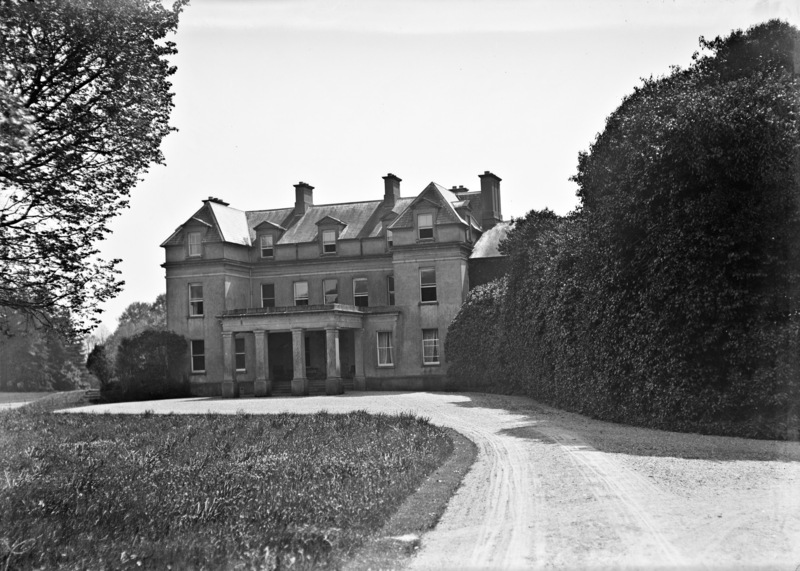 Is it a side view of Courtown House? It's actually the north side, not the west side. It is Courtown house. Here it is in the Lawrence archive: L_ROY_09931, and the 25" map. [http://www.flickr.com/photos/[email protected]/] [http://www.flickr.com/photos/[email protected]/] [http://www.flickr.com/photos/[email protected]/] That is a Mansion! [https://www.flickr.com/photos/gnmcauley] Archiseek claims it was only pulled down in 1962. Here is the Viscount and his household in the 1911 Census. 8 in the family, 8 servants in the house itself. The servants were a Butler, Cook, Nurse, Ladies Maid, 2 Housemaids, Kitchen Maid, Groom. No Valet, but then the Viscount himself was not at home. [https://www.flickr.com/photos/gnmcauley] You can read the Earl's Diary at TCD. The Viscount Stopford was his son. Actually the 6th Earl was still Viscount Stopford in 1911, so it is "your" Viscount. In 1901 the Viscount was home, but still no valet: Butler, Governess, Cook, 2 Ladiesmaids, 2 Housemaids, a Kitchen maid and a Groom. Viscount James in the census became Earl in 1914, so depending on the date of this photo, he could have been either at the time. So sad that it is gone!!! Blessings from Texas!! !